This video describes why video is an effective communications tool and why Mediapolis is well positioned to help businesses and individuals produce their content. At Mediapolis we believe that every organization has a story to tell. Stories help your customers engage with your brand. Corporations, small businesses, government agencies and non-profits all can benefit by telling stories. At Mediapolis we tell stories with videos, photography and websites. Stories start by defining what makes your brand or organization unique in the marketplace, what drives your operational excellence, business values, growth and success? Using the power of storytelling we create memorable content that engages, inspires and enlightens your target audience. Every corporation, small business, government agency and non-profit needs a video. There are hundreds of reasons that videos are so popular and effective, but how can you be sure your video will be received well by your viewers? Meaningful stories start by hiring a professional. A professional has the experience, knowledge, skills and the right gear to consequently get the job done right. DIY may work for some projects around the house, but when you want a complex job done right – you hire a professional. Professionally produced videos translates into being trustworthy, credible, and authoritative. According to Brightcove, 62% of consumers will develop a negative perception of your brand if you publish a poor quality video and 60% won’t engage with your brand. Therefore the difference between amateur and professional is the quality. And professional quality builds trust. 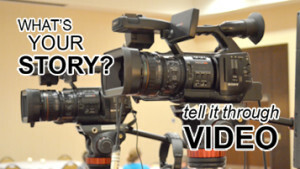 We offer full service video production so that we can tell your story from concept to completion. Our services include script writing, multiple camera shooting, editing, motion graphics, audio recording, foreign language translation, closed captioning and audio description. We also offer multi-camera live event production including live streaming. A single photograph can tell a story. But cramping everything into one photograph can make the image seemed cluttered. To avoid this, tell your story with a series of photographs. Start with two or three shots arranged in a frame or collage with hundreds of photos. Basic stories will usually include the elements of introduction, plot and conclusion. Our photography ranges from portraits of executives to people at work, events, products, real estate and architecture. These may appear in publications, annual reports, marketing brochures, image pieces, advertising campaigns and websites. Tell your organization’s story on your website. It’s not just a matter of adding text, photographs and videos to a website. Your homepage leads viewers into the body of the story. If you think about a good novel, it’s often the first few paragraphs that determine whether people will buy and read the book in full or not. The same is true with visual stories or in this case a website. We build websites from content management systems (CMS) like WordPress, SquareSpace and e-commerce sites like Shopify. Thousands of customizable templates will save you money on building the back-end of your website. Search Engine Optimization (SEO) is built into the platform. Since the platform works like a word processing application you can easily update or change content to tell your story. Our flexibility and scalability of business processes allows our clients to expand into new markets, drive product innovation and generate new revenue streams while enhancing customer experience. Businesses of all sizes look to Mediapolis for its knowledge and expertise to fill their talent, technology and strategic gaps so that they can grow in today’s highly competitive marketplace. Our versatile talent is trained in high demand services that produce professional results and achieve the desired goals. For over three decades we’ve combined people, technology and insights to offer integrated media solutions for clients of all sizes. We help our clients identify and leverage trends that allow our clients to turn obstacles into opportunities, consequently we’ve earned the confidence of some of the world’s leading global institutions and small businesses. We set the standard by helping our clients achieve operational excellence by looking beyond the task at hand and seeing the potential and making it a reality. What’s your story? Share it with the world by partnering with Mediapolis.